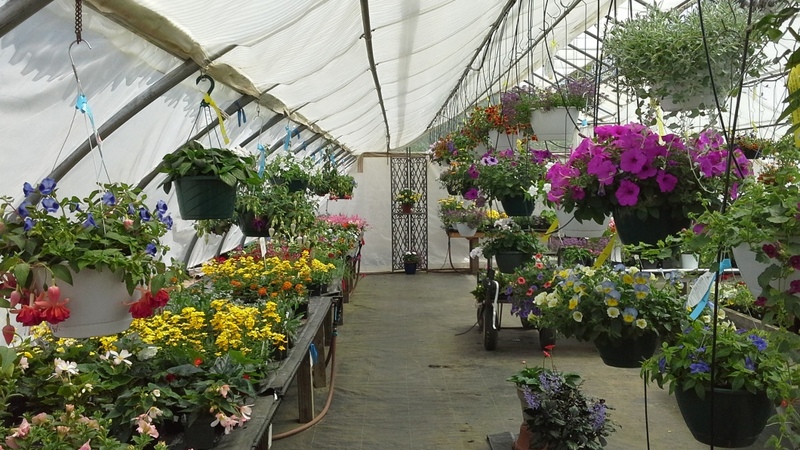 If you’ve been to Amazing Flower Farm, you already know our hanging baskets are special. We design the combinations ourselves. They are distinctive, unique – not mass-produced. And much more thought, planning, and care goes into our hanging baskets than meets the eye. They are locally-produced, through and through. 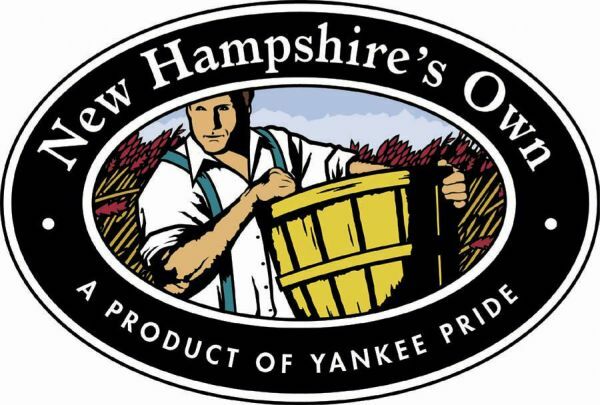 Not only are the plants in them grown by us, either from seed or from baby plants started by wholesale greenhouses in New Hampshire and Massachusetts, we have found a local manufacturer of the baskets themselves! K & C Plastics of Leominster, MA, makes excellent hanging baskets. They cost slightly more than the old ones we got from greenhouse suppliers, but they hold more soil so the plants have more room to grow and hold water, and they have saucers on the bottom so watering isn’t as messy as with the old baskets. The plastic is tough, resilient, and not brittle. We had to work hard to track down the manufacturer of the strong, old-fashioned wire hangers we are transitioning to. They, too, used to be made in Massachusetts, but the machinery got sold and we were told by greenhouse suppliers that they weren’t available anymore. Undaunted, Ara Lynn drove to the former manufacturer to get contacts that eventually led to the current owner of the machinery, a small company located in Illinois. Not exactly local, but our wire hangers are completely made in the USA, and are better quality than what is available on the mass market. Plus, they won’t snap with re-use like plastic hangers can. We re-create a healthy eco-system for the plants in each hanging basket. Sterile potting soil is the basis for healthy container-grown plants, but it is sterile. What it provides is the structural foundation for the root system (and we are very picky about how we put that soil in the basket so the roots have the best environment possible.) But most plants need a lot more than potting soil & water to thrive. Our potting mix contains mycorrhizae, a living organism that forms a symbiotic relationship with the plant roots, with much benefit to the plant, helping it better utilize available nutrients and water. We add yet another beneficial fungus that colonizes the roots to help prevent root rots. Then we add beneficial nematodes—microscopic creatures that attack the larvae of certain insects which are attracted to potting soil and like to eat plant roots. On top of that, we release tiny beneficial insects into the greenhouse to prevent and control pests that are likely to attack plants. Each of our hanging baskets is a healthy micro-ecosystem. By working with nature, we grow plants that are healthy and robust, better able to withstand and recover from the stresses that occasionally occur in hanging baskets (like accidentally forgetting to water them). We make it easy for you to keep your hanging basket beautiful. We put a half-dose of slow release fertilizer in each hanging basket. This treatment helps even out the nutritional needs of the plants and buffers them against the stress of unusually inclement weather. If you regularly fertilize your hanging baskets, you can cut the amount of your fertilizer in half (which is what we do in the greenhouse). If you only water your baskets, we can add the other half-dose of slow release fertilizer for you, and the flowers in your basket should be happy through the summer. 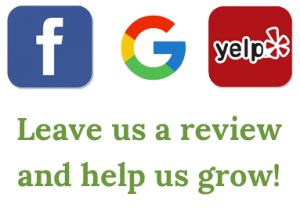 If you have any questions about how to keep your basket looking its best, our knowledgeable staff is happy to show you specific techniques for maintaining each of the plants in your basket. We can also help you choose which flowers will do best in the location where you want to put your basket. 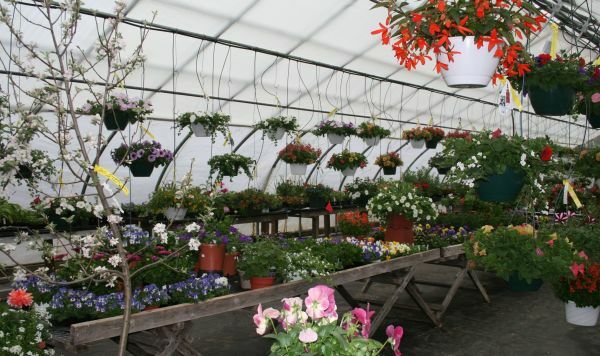 How Hanging Baskets from Amazing Flower Farm protect the environment. 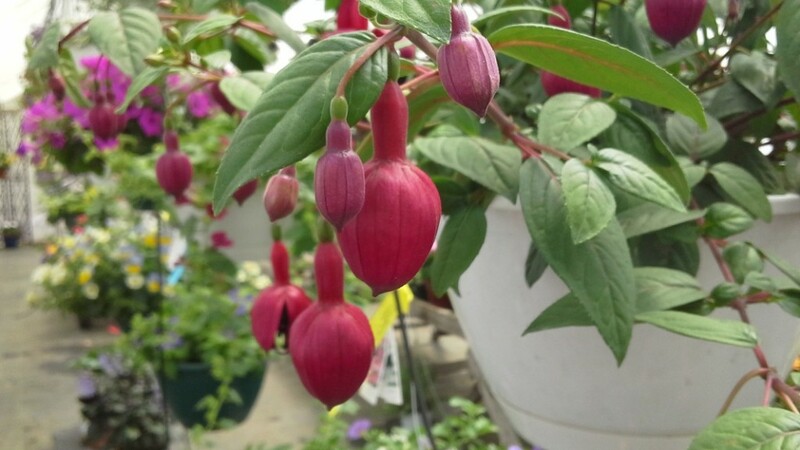 What we do NOT add to our hanging baskets are systemic pesticides, which have a long residual action and which many large growers, especially those that supply the chain stores, routinely add to their hanging baskets. These systemic pesticides are very common. They are a quick fix, very easy to use. Not only does big agriculture use them, you can find them abundantly in almost any store that sells garden supplies to you, the consumer. Systemic pesticides are absorbed into the plant (as well as the soil, for those that you spread on the ground) and insects that start eating the plant perish. Unfortunately, the poison is also absorbed into the pollen and nectar of the flowers, and it persists for a very long time. Scientific studies now indicate that these systemic pesticides are behind the mysterious Colony Collapse Disorder that has been killing off honey bees. We need honey bees, and we need wild insect pollinators (many visit our flowers) because they help produce the food we eat. Hummingbirds also visit many of the different flowers in our hanging baskets. We don’t like the idea feeding these delightful and useful creatures poison by tossing a spoonful of pesticide into our hanging baskets. We think our hanging baskets do just fine without that.